A small hill crowned by an active pagoda marks the legendary founding place of Phnom Penh. The hill is the site of constant activity, with a steady stream of faithful trekking to the top and a constellation of vendors, visitors and motor taxis at the bottom. Elephant ride are available. It is 6 minutes drive from Sokha Phnom Penh Hotel & Residence. Phnom Penh's Night Market on the riverfront is aimed squarely at visitors and tourists, offering a wide and varied selection of Cambodian handicrafts silks, art and souvenirs. It is 6 minutes drive from Sokha Phnom Penh Hotel & Residence. It is a colonial-style building in the heart of the Phnom Penh capital. Its Khmer name Phsar Thmey translates as "new market", although it is more commonly referred in English as Central Market. It is 7 minutes drive from Sokha Phnom Penh Hotel & Residence. Located just north of the Royal Palace, the National Museum has recently been restored and represents the finest of Phnom Penh's architecture. On display inside are more than 5,000 works of art, ranging from the 7th to the 13th century. It is 9 minutes drive from Sokha Phnom Penh Hotel & Residence. Built in 1866 by King Norodom. The Royal palace is now home to His Majesty Preah Bat Samdech Preah Baromneath Norodom Sihamoni. The Palace grounds are opened to the public except when the King is in residence. 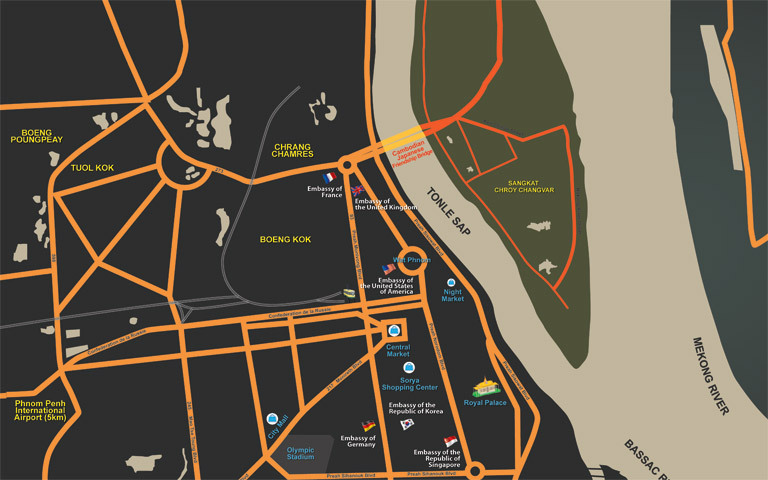 It is 9 minutes drive from Sokha Phnom Penh Hotel & Residence. The monument was inaugurated in 1958 to celebrate the independence of Cambodia from foreign rule. It is 10 minutes drive from Sokha Phnom Penh Hotel & Residence. If we start from a Point Zero in Phnom Penh, it is the riverside. Along the riverside you find the oldest sectors of the city and footprints of different generations since the kings abandoned Angkor to the arrival of the French colonization. The views of the rivers are amazing with the confluence of the Mekong, Tonle Sap, and Bassac rivers just in front of the Royal Palace.